Why Does Gargamel Hate Smurfette? In the new Smurf movie, Smurfette and Gargamel vaguely mention that Smurfette betrayed Gargamel and that Gargamel especially wants to capture Smurfette out of all of the Smurfs. You might think that it is just because Smurfette is the only girl (which she isn’t really). In actuality, it is because Gargamel created Smurfette and then she turned against him. The Smurfette that Gargamel created wasn’t the sweet, blonde Smurfette that we all know today. Want to know more? Check out our post Why is Smurfette the Only Girl for the whole story plus the original Smurf cartoon that explained it. Why is Smurfette the Only Girl? Everyone always asks why Smurfette is the only female Smurf. The answer is that all of the Smurfs were initially males. However, when Gargamel was trying to figure out how to get to the Smurfs, he decided that he would get to them through their hearts by creating a female Smurf. Gargamel fashioned Smurfette out of sugar and spice (but nothing nice), crocodile tears, half a pack of lies, the chatter of a magpie, and a heart of stone. 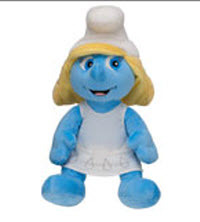 Smurfette was found in the woods crying and was readily taken in by the village. Interestingly, she was not the beautiful blonde Smurfette that we all think of; she started with stringy black hair. Eventually Smurfette started turning the Smurfs against each other until they saved her life. Smurfette repents and Papa Smurf casts a spell on her to make her “new and improved” (which is blonde and full Smurf). Who Is In the New Smurf Movie? The new Smurf movie is promising to have a great lineup of celebrities. Here are just some of them that are already signed on. The movie is still in production, so we could see some changes. Quite a list! I haven’t seen Jonathan Winters in anything new in years. This will definitely be one of those movies where I am listening for voices throughout.